A Japanese bride, at Daikakuji to have her picture taken, wears traditional Japanese clothing. I love touring historical sites, but it’s rare that I see one that I’d like to move right into. 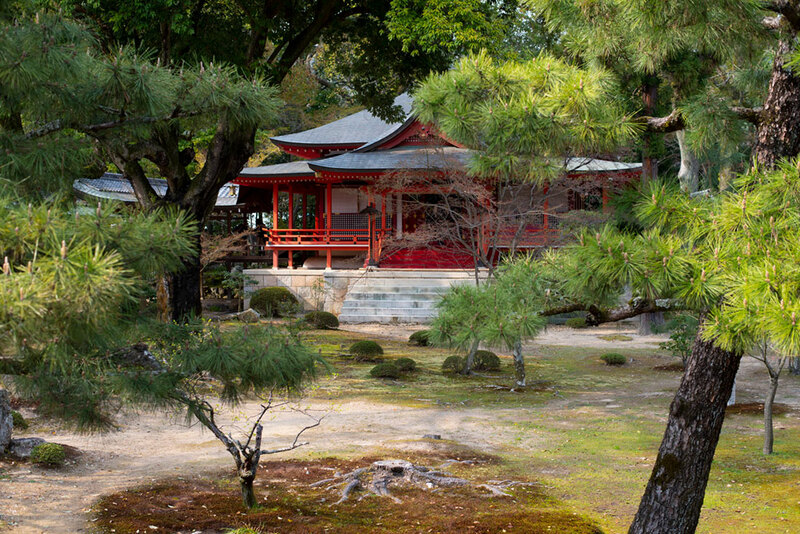 Daikaku-ji, a former retreat of the Japanese Emperor Saga (785-842) and other emperors, is one I would. 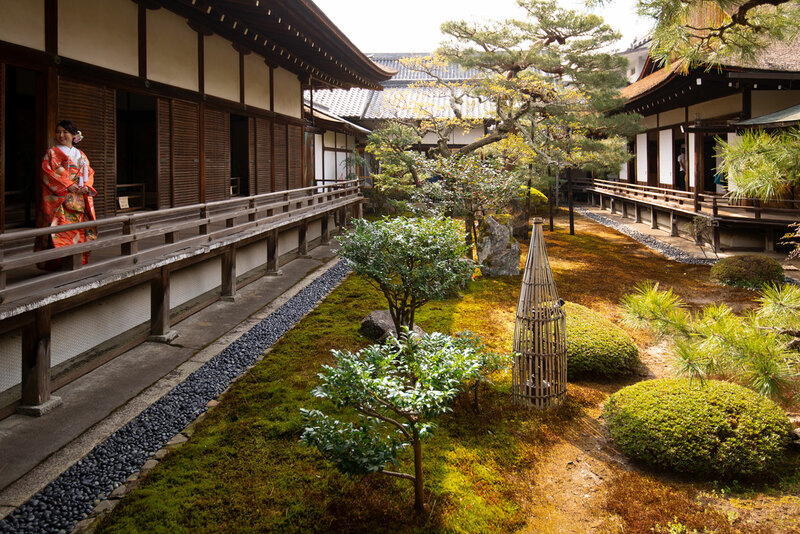 Strolling through this serene, calming temple compound in Kyoto, Japan, was one of the most refreshing experiences I’ve had in years and has caused me to think more deeply about how architectural and garden design can combine to create a soul-satisfying retreat. 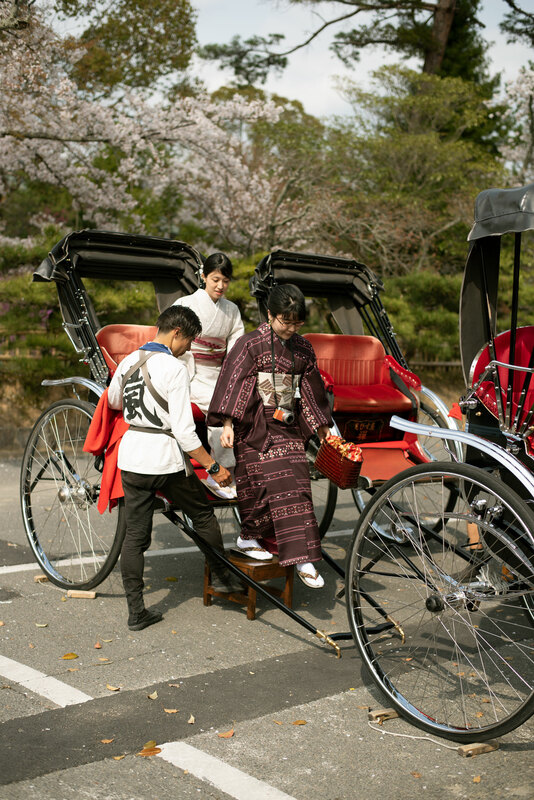 Tourists in kimonos arrive at Daikakuji via rickshaw. A canal and bridge near the entrance to the temple. 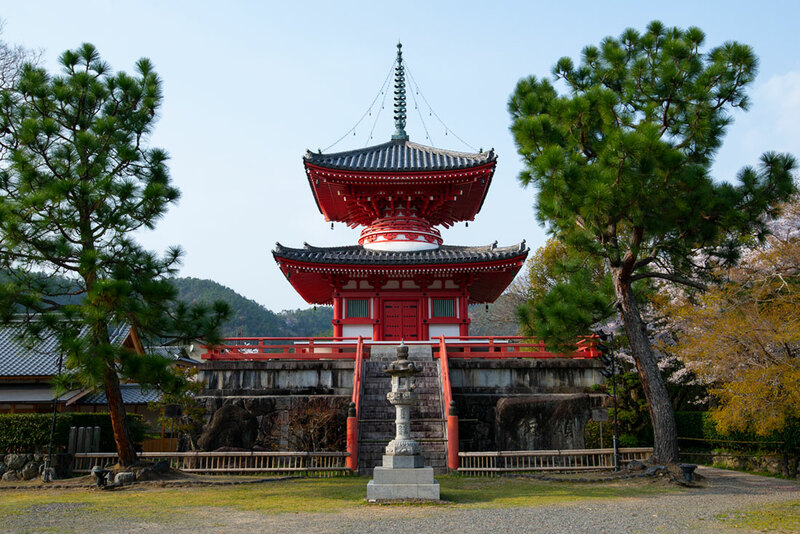 Currently a Shingon Buddhist temple, the retreat dates back to the year 814, when Emperor Saga had a palace built on the current site. He retired to there (who wouldn't if they had the choice?). After Emperor Saga died, his daughter, who was a consort of his successor, converted the retreat to an imperial temple. A number of subsequent emperors also retired to the temple and became monks but also continued to engage in what was called “cloistered rule.” This meant that they turned ceremonial day-to-day duties over to a successor but continued to wield real power on key decisions. 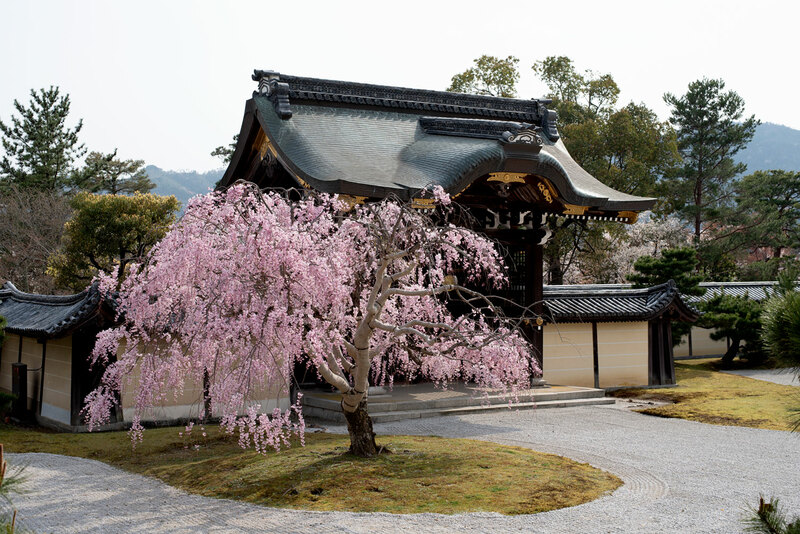 The current temple contains buildings from various eras, some transferred from the imperial palace in Kyoto. 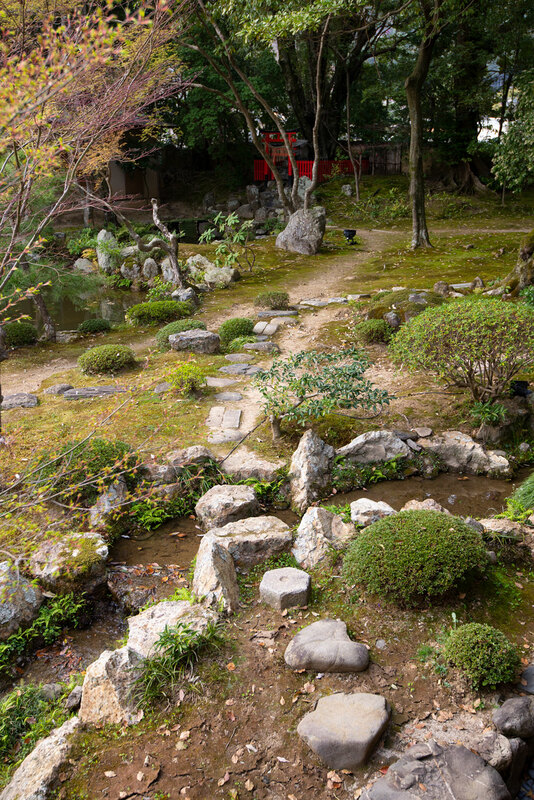 The buildings are set among a secluded natural garden rather than the formal arrangement of an official palace where the emperor carried out more structured state ceremonies and business. 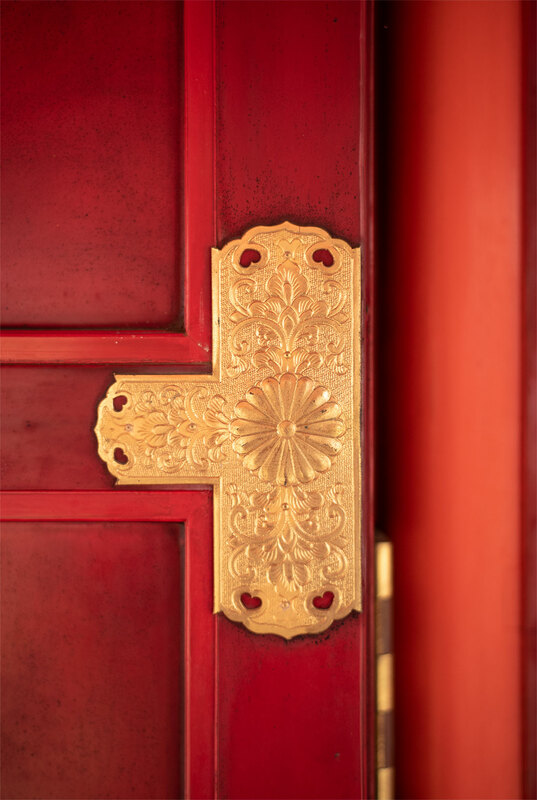 Both Japan and China, from whom Japan got many of its imperial court customs, long had the practice of emperors having both official, very structured palace compounds in their capitals for official business and retreats where they could live a more relaxed life. These retreats were typically beautiful gardens with a natural park setting into which were set rustic but still exquisite timber frame buildings. A number of Japan and China's most famous historical sites reflect one or the other of these two types of palaces. 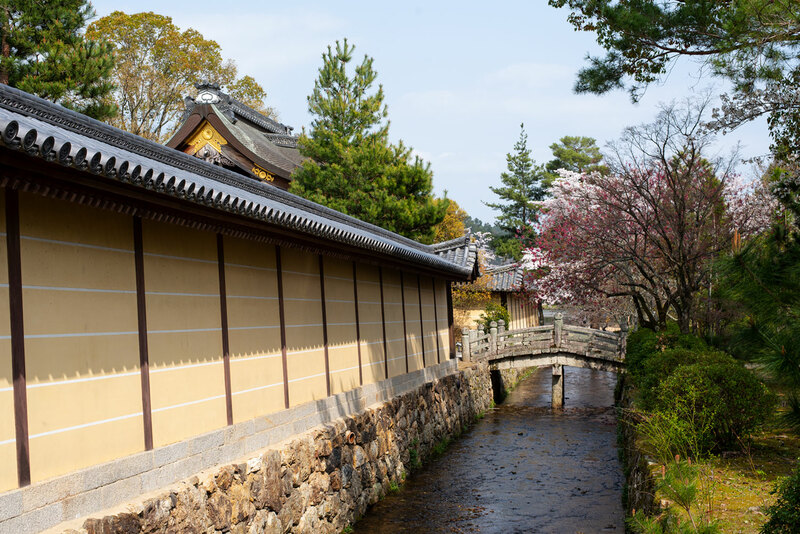 This means that while the imperial palace was intended primarily to impress, with its massive ornate gates and halls and large formal courtyards, the retreat's palaces were tucked among the trees for privacy. 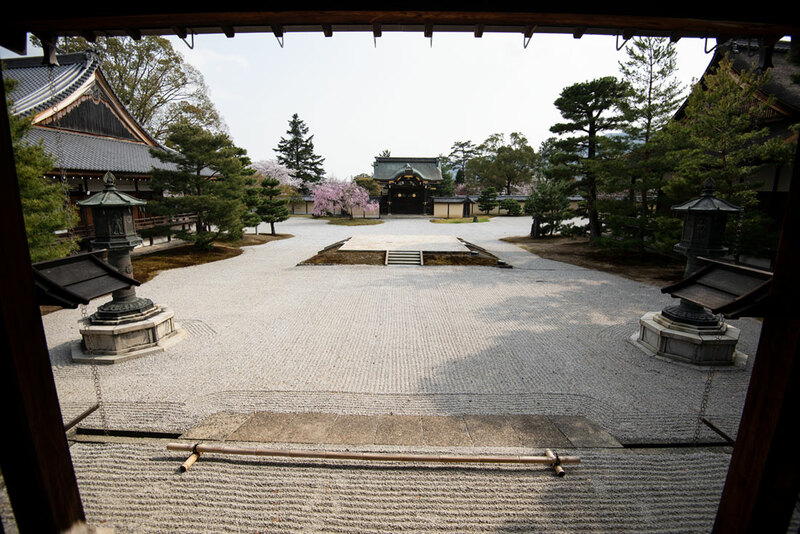 The emperor's gate to the temple opens into a white gravel space, the only open place in the compound, providing a calming introduction to the quiet retreat. 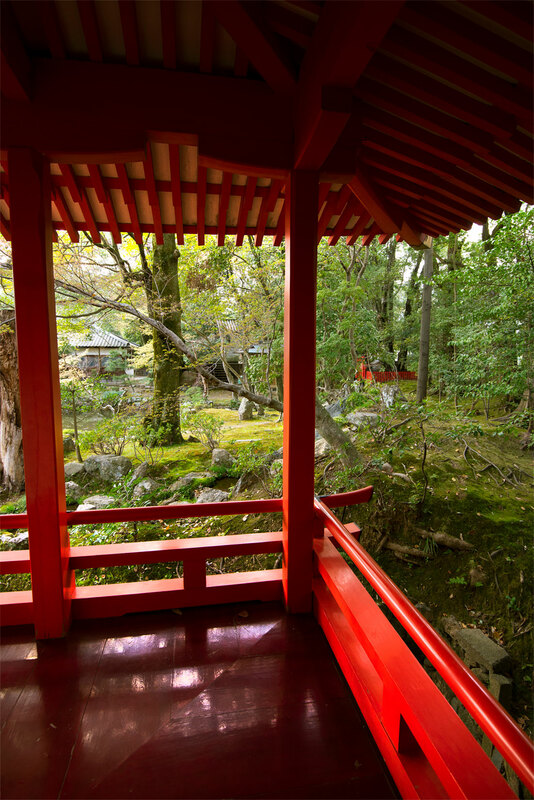 The temple itself consists of several timber frame buildings tucked among the trees, with viewing gardens planted between buildngs. 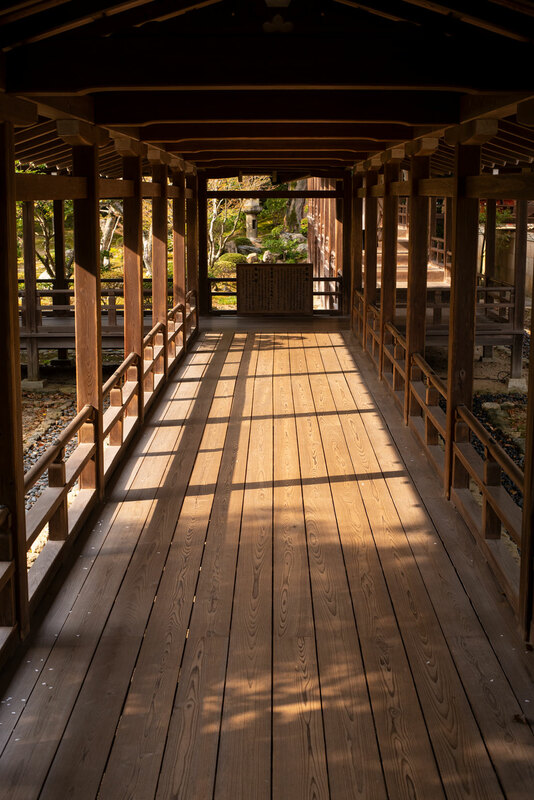 Visitors wander through the palace on elevated covered wooden corridors that connect the buildings and on verandas on the sides of the buildings so that they can view but can't walk in the carefully groomed gardens. The buildings are beautifully tied together visually by dry stream beds of rocks that appear to "flow" between and under the buildings, a functional drainage feature that contributes to the serenity and unity of the site. At one point during the Emperor Saga's reign, Japan suffered a serious epidemic. At the suggestion of a Buddhist monk, the emperor copied by hand a key Buddhist document called the Heart Sutra. His devotion was said to have resulted in the epidemic ceasing. 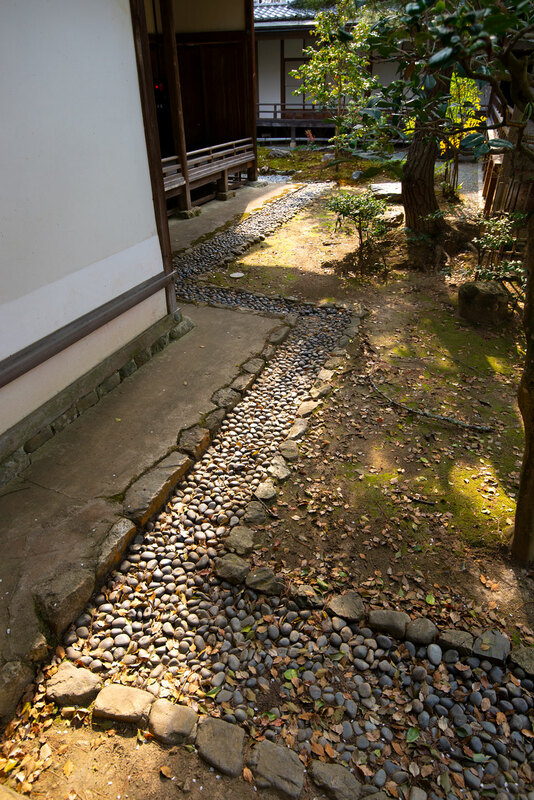 That sutra is currently kept at the temple's Shingyoden Hall. 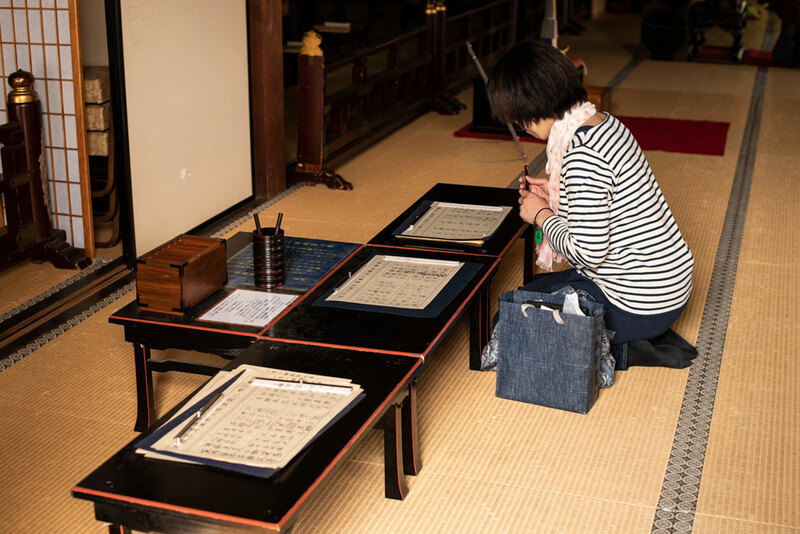 In commemoration, people still go to the temple to make copies of the sutra that are kept with the first sutra. They kneel reverently in the temple and carefully copy sections of the sutra. Exquisite details on doors, timbers and other areas of the site encourage visitors to slow down and savor the craftsmanship of the buildings. Daikakuji is a popular place for Japanese brides and grooms like this couple to have their pictures taken in traditional clothing. The temple’s large artificial pond and garden on its shores dates back to Emperor Saga’s time and was modeled on a famous lake called Dongting Lake in Hunan, China, that was the original site of dragon boat racing. The features on the shore of the pond such as the pagoda below, a dry water fall, bridge and other structures were intended to be seen from a boat on the pond. 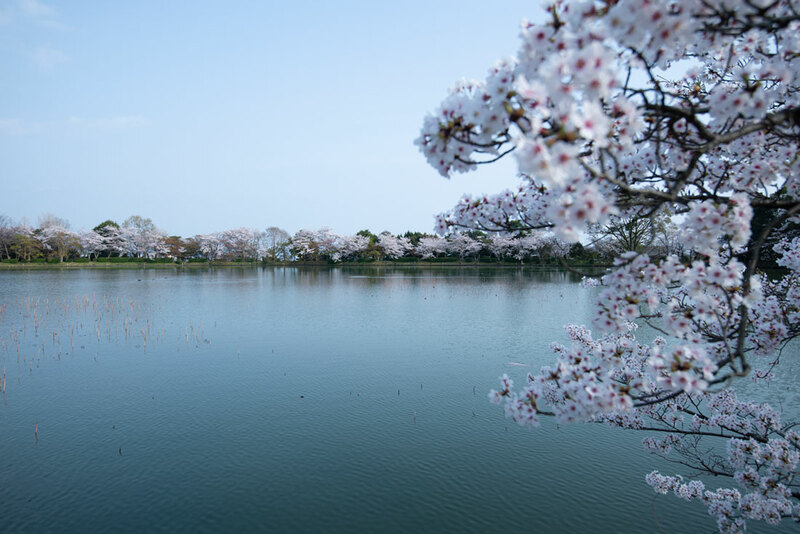 Daikakuji is a popular place to view cherry trees that bloom around the lake in the spring and to view the moon in the fall at the time of the harvest moon. Donna Rouviere Anderson and Forrest Anderson are working on a book about Japanese design.